How’s this for close surveillance? 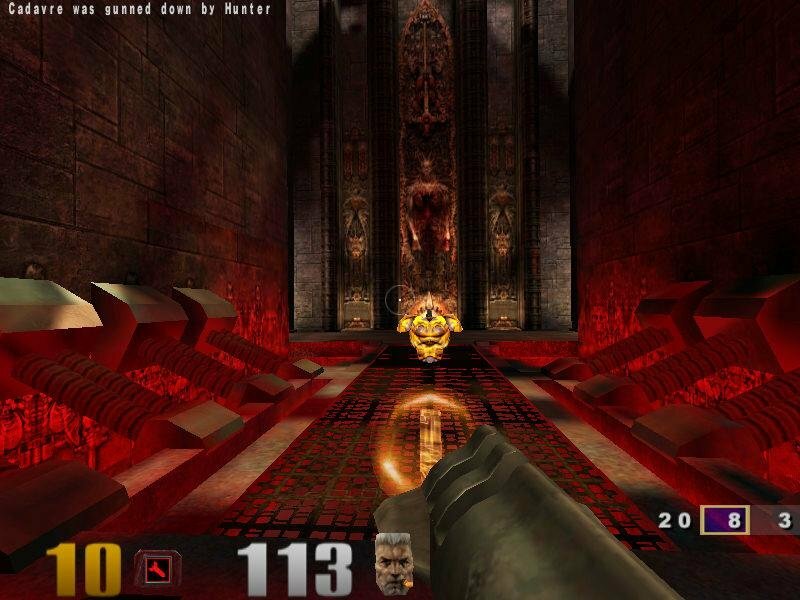 You can’t talk much about first-person shooters and not mention id Software. 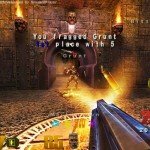 The once tiny developer essentially created the genre with Wolfenstein 3D, way back in the days when a 486 was considered a smoking-fast machine. 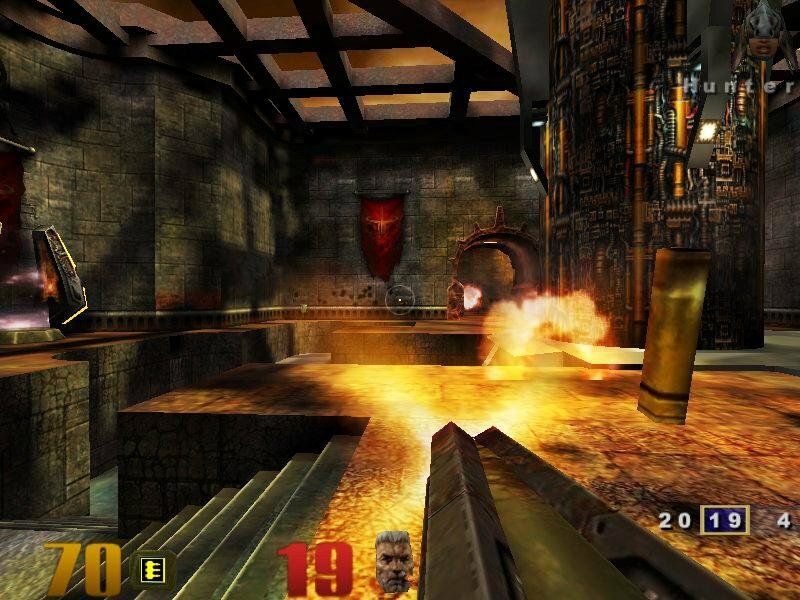 While its first 3D shooter garnered a lot of due praise and recognition, it was their next game that made id’s fortune and established their reputation as leaders in the action game industry for years to come. 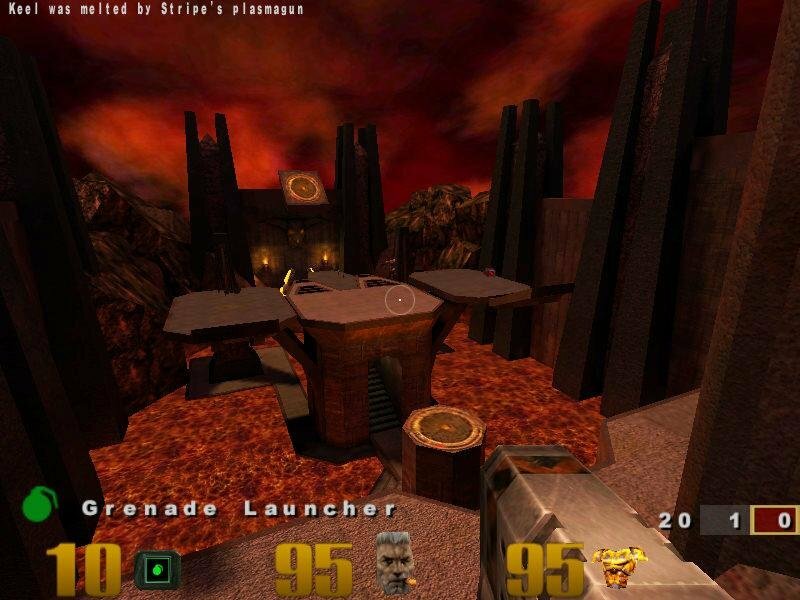 Doom soared in popularity in part thanks to its introduction of the concept of deathmatch, and laid a lot of the groundwork for contemporary multiplayer gaming to follow. 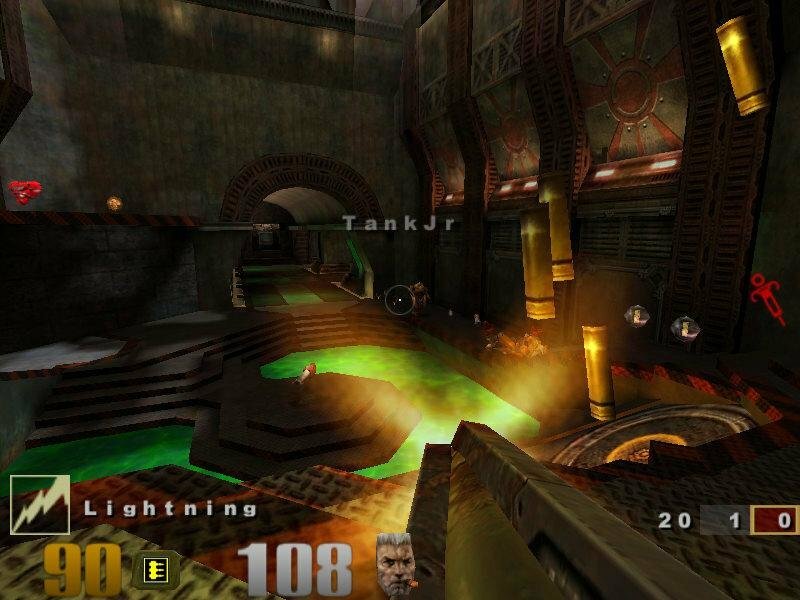 Their aspiring post-Doom flagship shooter, Quake, earned them more fame and truckloads of cash. 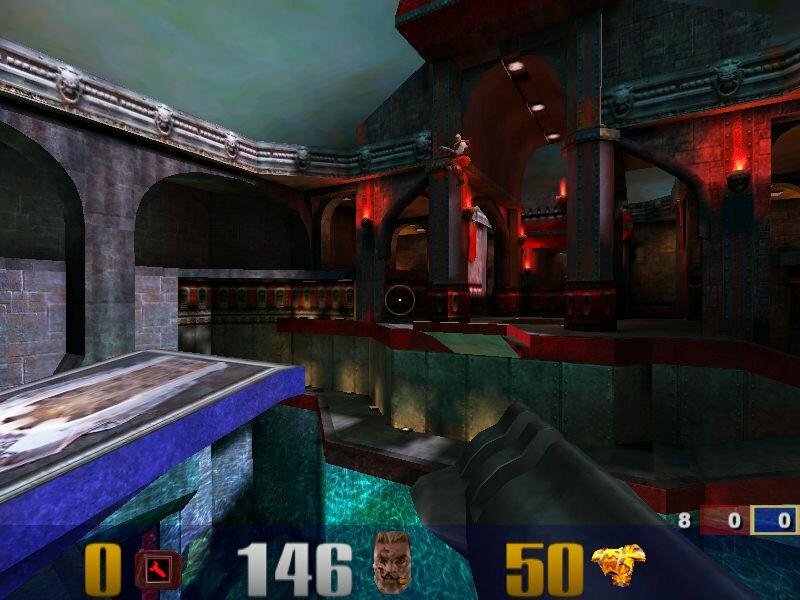 While the first Quake and its sequel were equally divided between singleplayer and multiplayer portions, id’s Quake III: Arena scrapped the traditional solo campaign altogether so they can better focus on what they believed is the real meat of the first-person shooter – online multiplayer, or more specifically, online deathmatch gaming. 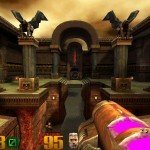 Despite the profusion of multiplayer-only titles, id was adamant that Quake III Arena would not be a multiplayer-only game. 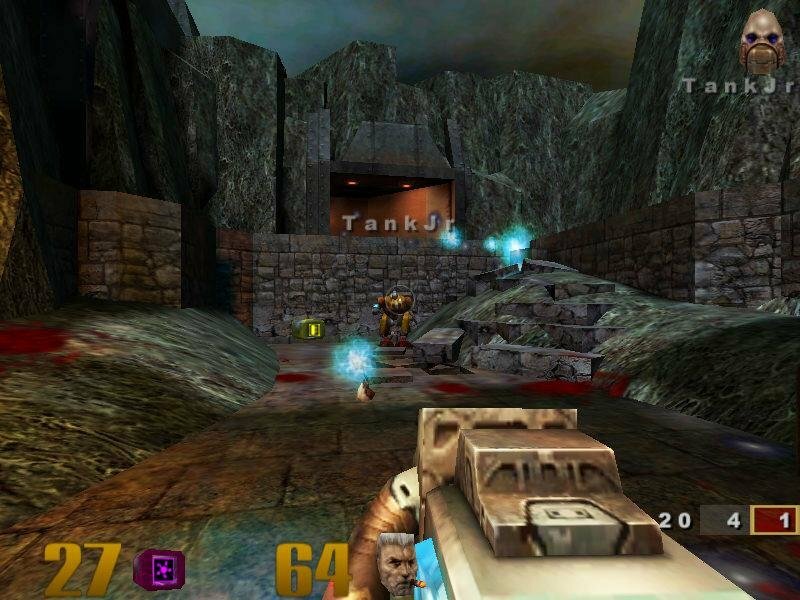 There would be a strong singleplayer element as well – a progressive deathmatch campaign against computer-controlled bots that id insisted would be an entertaining game experience in its own right, rather than a mere training ground to prepare players to face human opponents online. 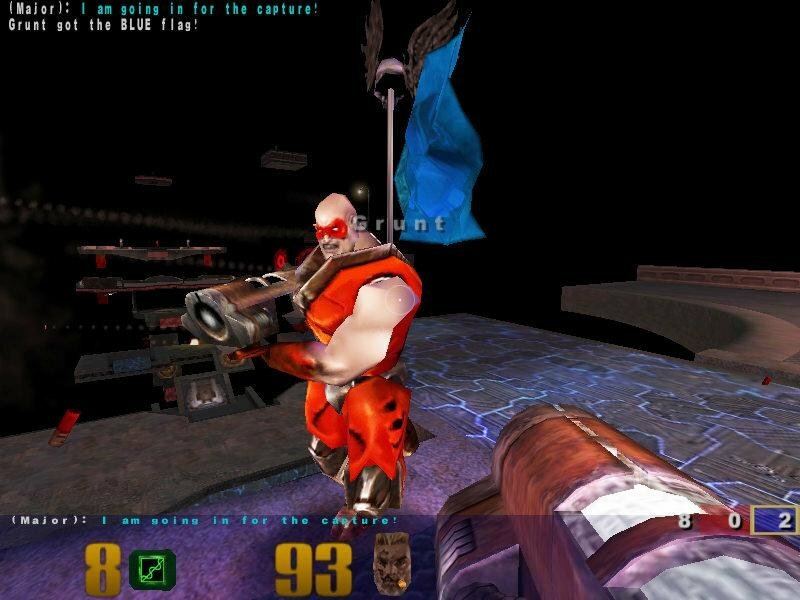 More than that, they aspired to create a product that would introduce deathmatch to the mass market and compete directly with Epic’s fabulous Unreal Tournament. On the retro side we’re reacquainted with many characters from past id games, although they serve little more than clothing for your avatar or cannon fodder as bots. Once you have completed the requisite training map (which is a little light on the training), you unlock the first “tier” of bot arenas. 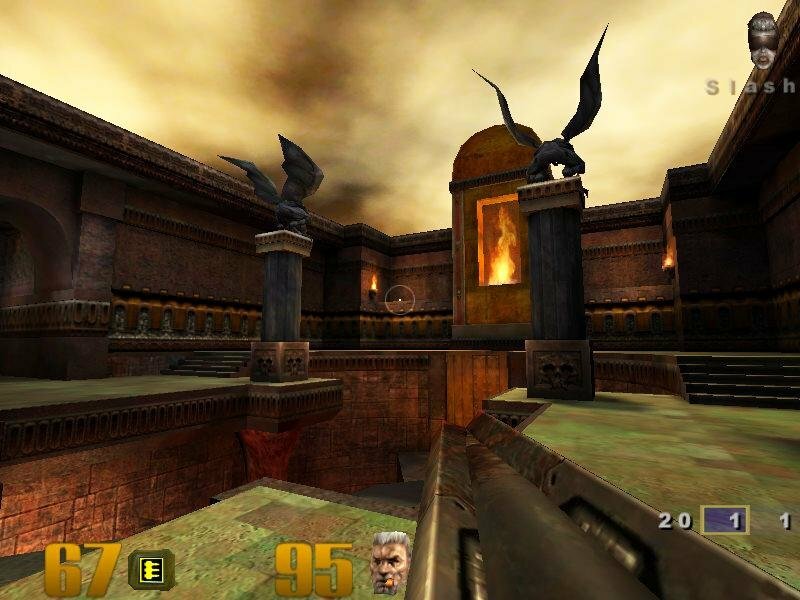 The entire singleplayer game is arranged in tiers, each composed of three different deathmatch maps and a final one-on-one “tournament” map. 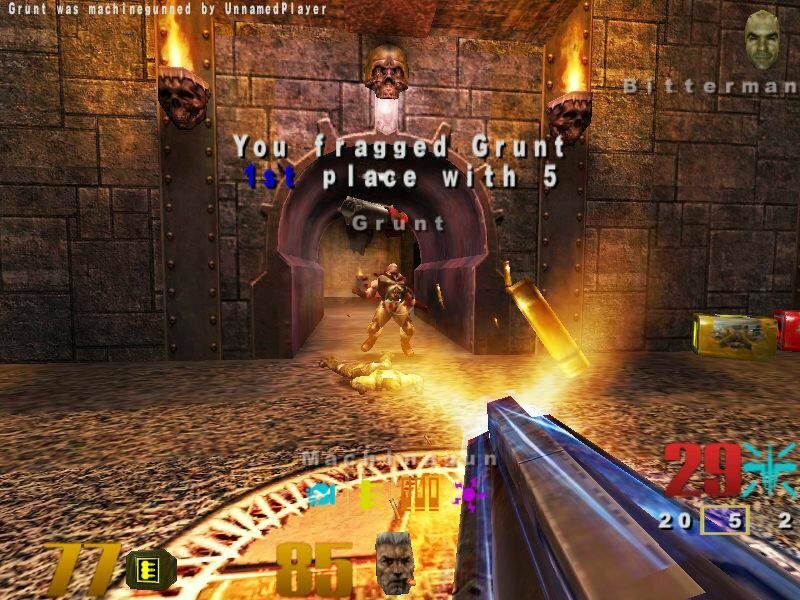 Much like in Unreal Tournament, it’s pointless grinding through the singleplayer when you can already play everything in skirmishes. This brings up one of the singleplayer’s biggest drawbacks – there simply is not enough content. 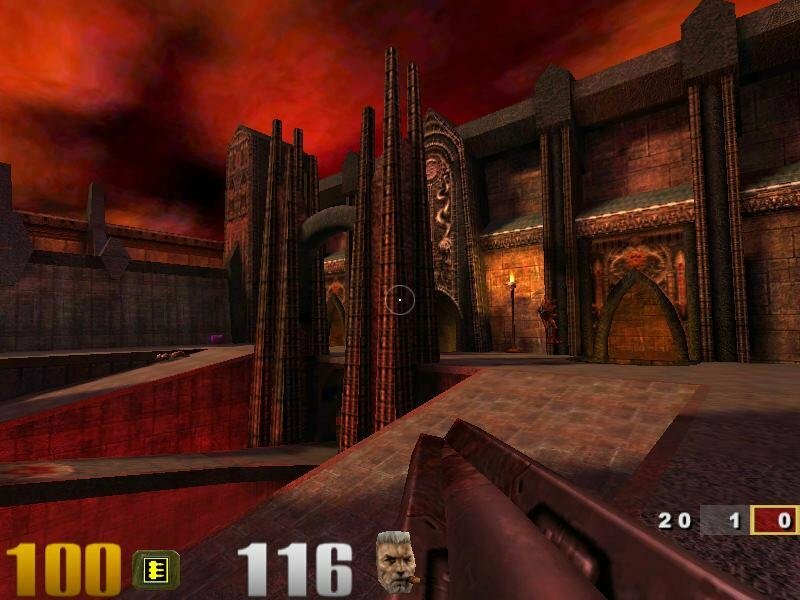 Unless you enjoy playing the game with the difficulty set so high that you have to replay every map seven times over, the average player can easily finish the singleplayer “campaign” in a single weekend. Of course you can go back and replay any map that you have already beaten – the tier-centric campaign takes note of various accomplishments you’ve previously earned, which is the only thing differentiating it from playing skirmish matches. The bot AI is another concern. It’s not as if the bots aren’t technically impressive – in many ways they are. If you’re standing outside a bot’s field of view, that bot will not realize that you are there (unless it turns around or you start shooting). Each of the bots is programmed to favor different weapons and each one has a different predisposition in combat, giving them some semblance of personality. They’re quite chatty and eager to taunt you after gunning you down or delivering praise should you score an impressive kill. There’s even a simplistic inbuilt text parser, so game characters can recognize and respond to some of your own messages – but this is mostly a hit or miss deal. Creepy little secrets like this show up at times. Where the bots really annoy is how they cheat on higher difficulty levels. On “Hurt Me Plenty” they hit with any weapon a suspiciously high percentage of the time, and it just gets more absurd from there. 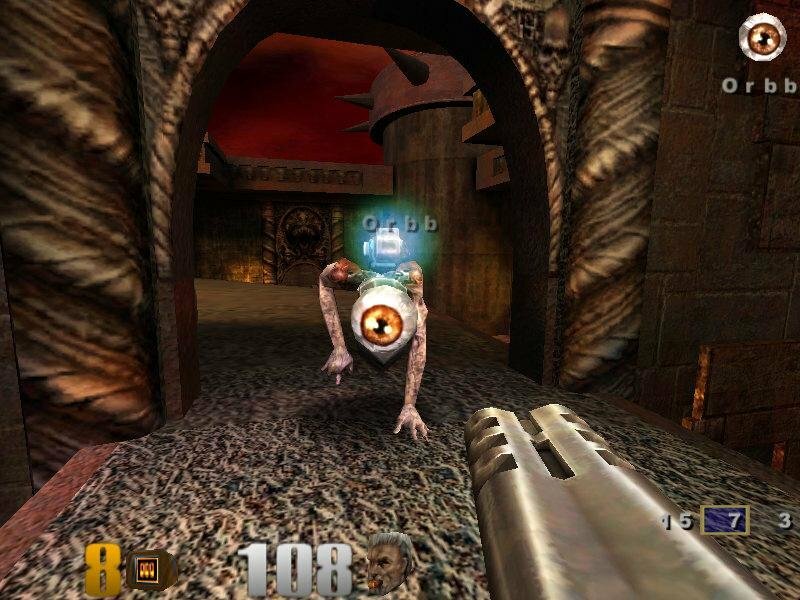 They also move and jump around constantly, and while this makes them a lot tougher to kill it seems to have no effect at all on their godlike aim. 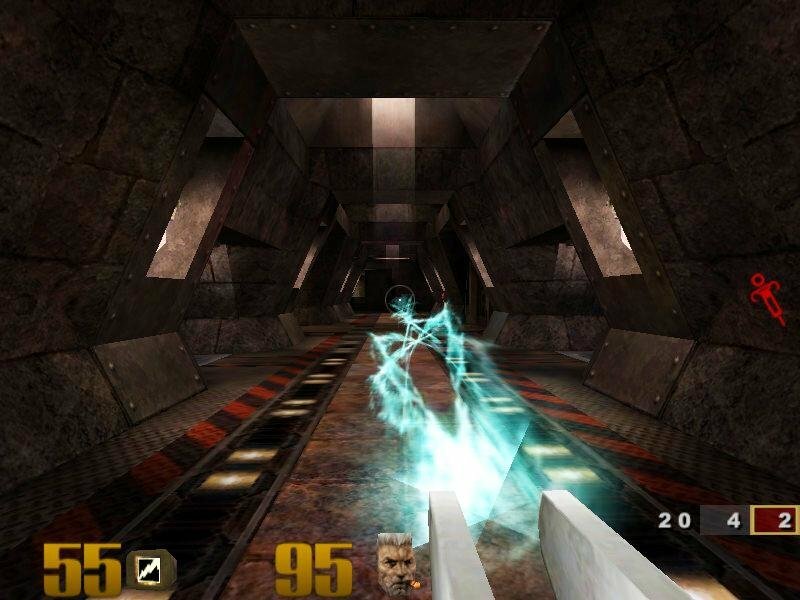 They will hit you with the railgun with casual ease, mid-jump, while you are dodging at close quarters. They make prediction shots with the precision of… well, a computer. 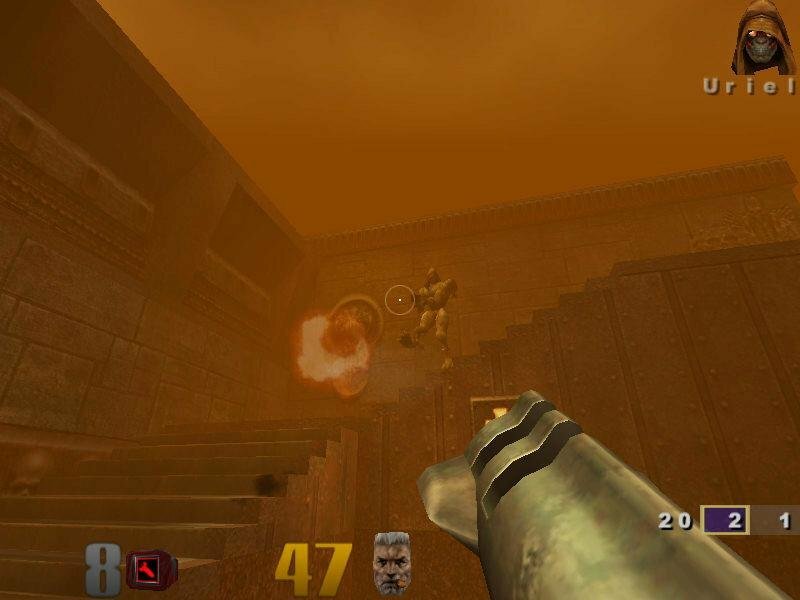 They will “juggle” you with rockets (one rocket knocks you helplessly into the air, the next kills you before you hit the ground). Here’s the problem—this simply isn’t very satisfying. 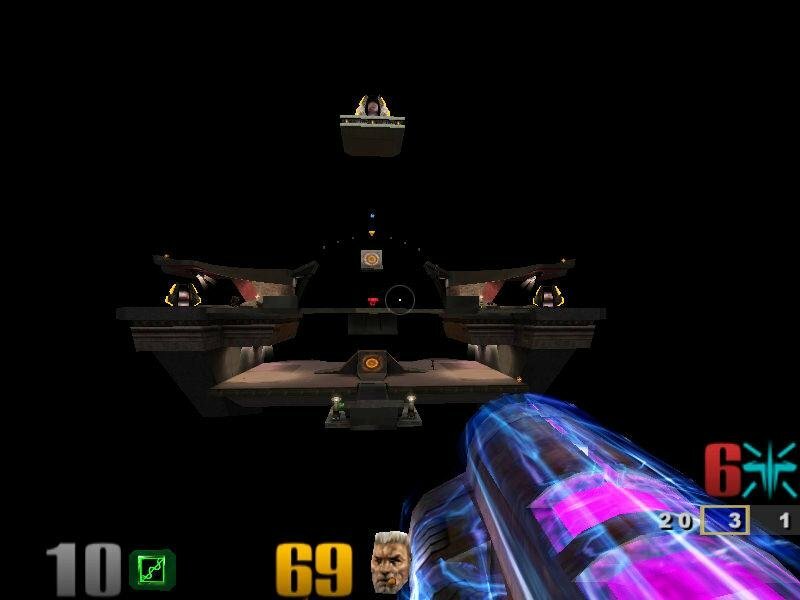 When a bot kills you by picking you out of the air, mid-jump off an accelerator pad, with a rocket… you feel cheated. Newbies will find themselves quickly outclassed by the game’s rapid advance in difficulty, and veteran players will find the bot behavior on higher difficulty levels as annoying as it is challenging. It would have been better if the bots actually got smarter rather than inhumanly precise, but really they don’t (or at least not by much). The game gets a little hectic when you pick up Quad Damage. Being a pesky camper with the Railgun. Multiplayer is, of course, where the game really shines. This probably won’t come as a surprise to anyone, but the game really is a step beyond past id offerings in this respect. 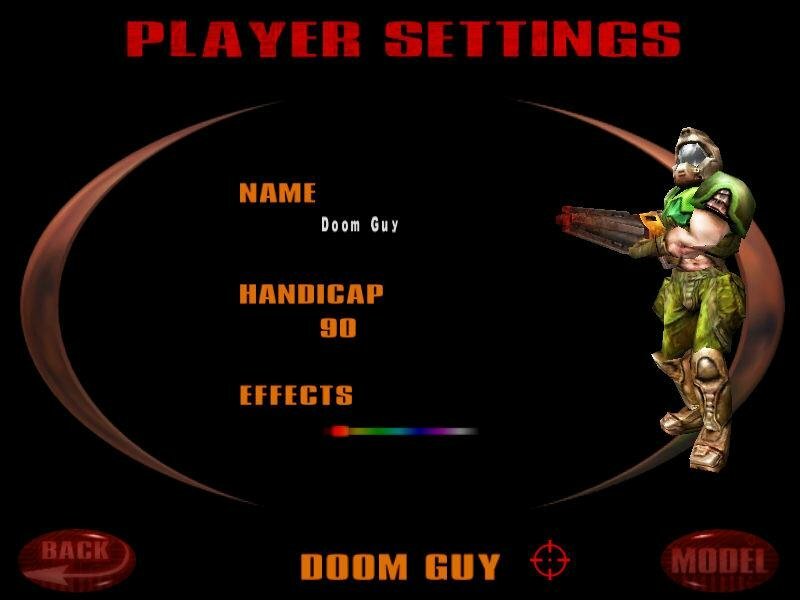 The interface is very user-friendly and good news to players who are newcomers to internet shooters (you can still play it on GameRanger). Once you delve into the multiplayer, you start to appreciate its subtleties. 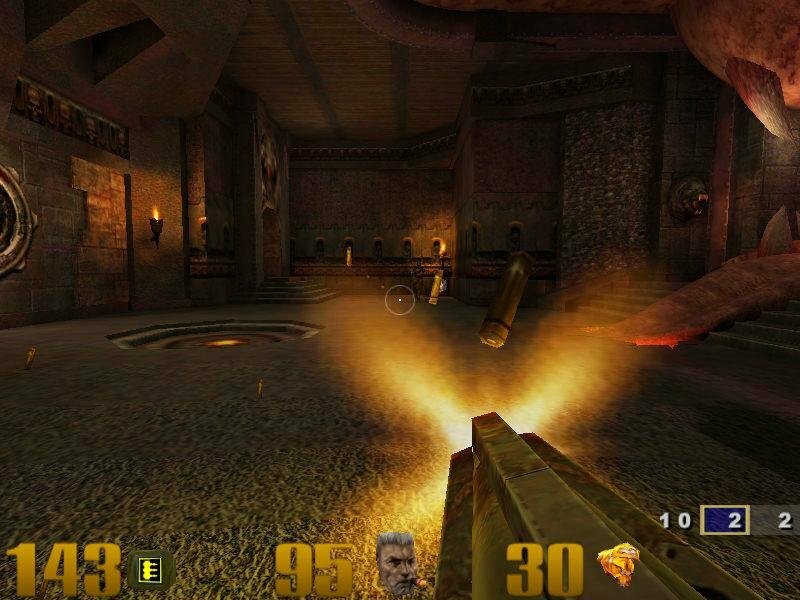 The weapons are superbly balanced, and a lot of thought has obviously gone into item placement. The maps themselves are finely built and look superb thanks to the state-of-the-art engine, with clever secrets and the ocasional hidden super-weapon placed here and there. But once again, the real demon here is the lack of variety – although you get quite a large number of maps, a disproportionate amount are centered around deathmatch, and while Quake III is great at inducing the frantic fun of gratuitous online fragfests, it ranks much poorly on other fronts. The only other notable game mode you get is a negligible Capture The Flag, with too few maps and an underdeveloped team-play aspect, both fatal flaws. 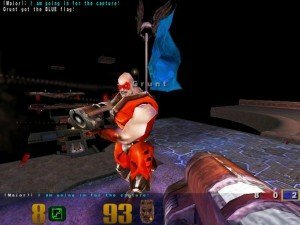 CTF mode is featured, but it’s not really fun. Players have become more sophisticated than this – they want complex objective-based levels that require people working as a team. 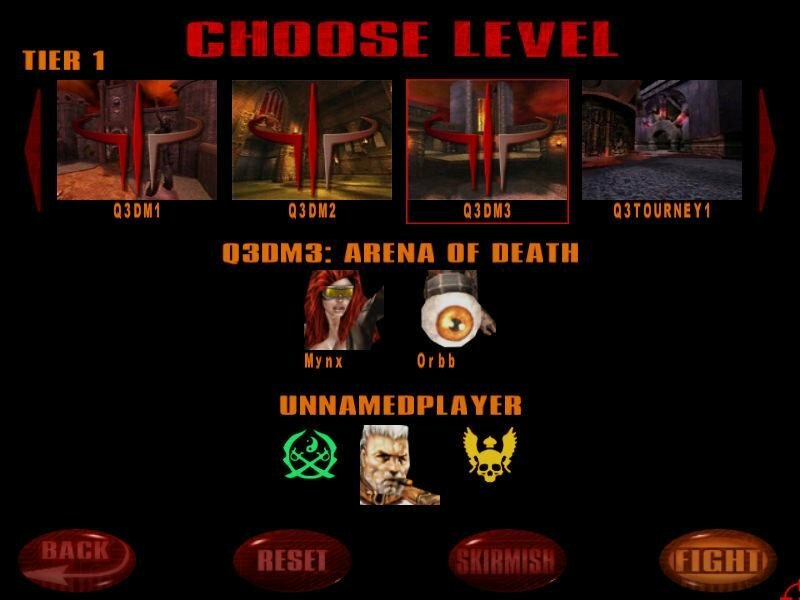 Sadly, this concept is missing in Quake 3, as the game utterly lacks the diversity, customization options, game modes and map themes of Unreal Tournament, it’s main competitor at the time. It is for this reason that Q3A ultimately cannot surpass its rival. 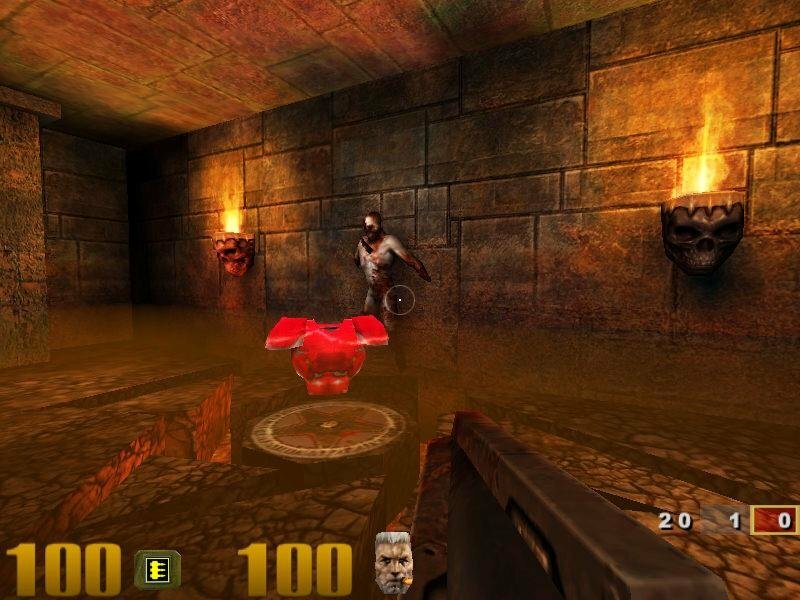 As far as deathmatch goes, however, it’s pretty much the best ride in town – finely polished, fast-paced and well designed, you can have some great fun with it – it’s just that Quake III can’t quite reach anything beyond its immediate grasp. Only Multiplayer. 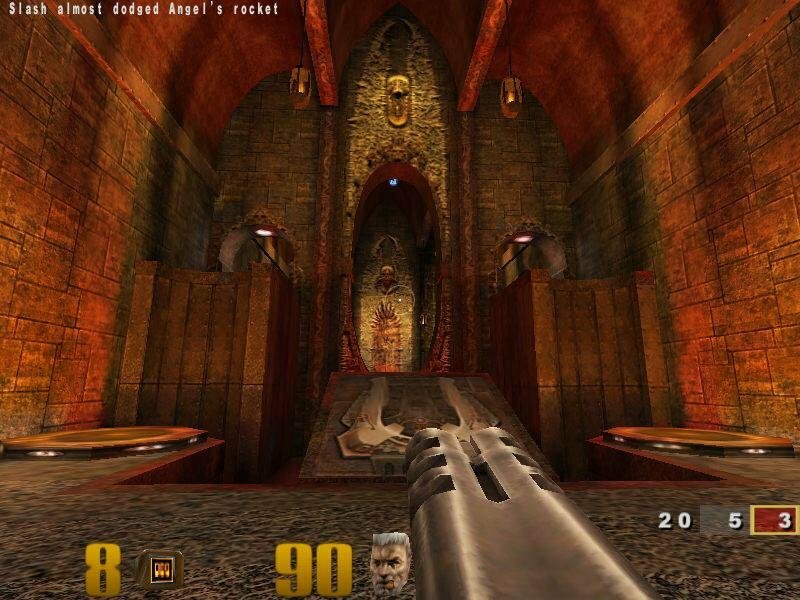 No story-driven like Quake I or Quake II. what a disappointment, deception. 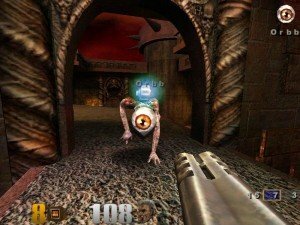 Thanks John Carmack to make the dull decision of making it only Multiplayer. 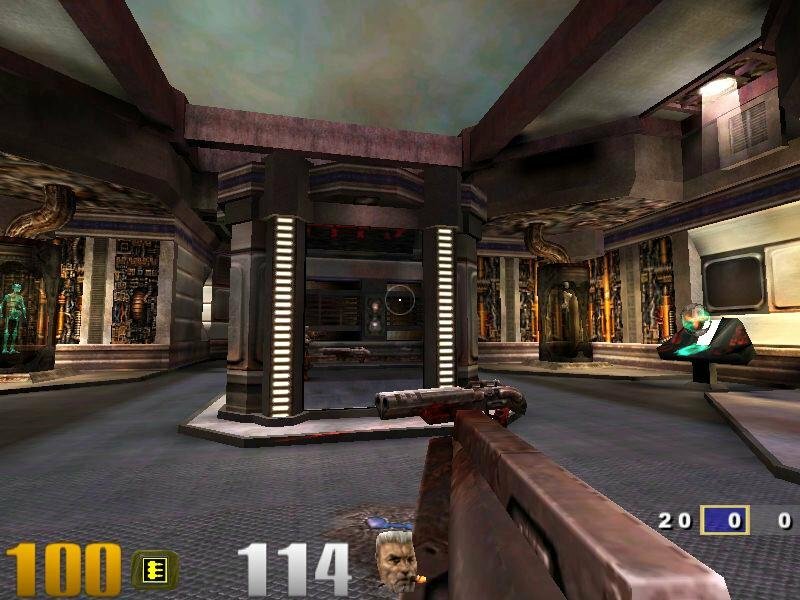 No puzzles, no search the key, no brains, no adventure, just shoot and kill, shoot and kill. 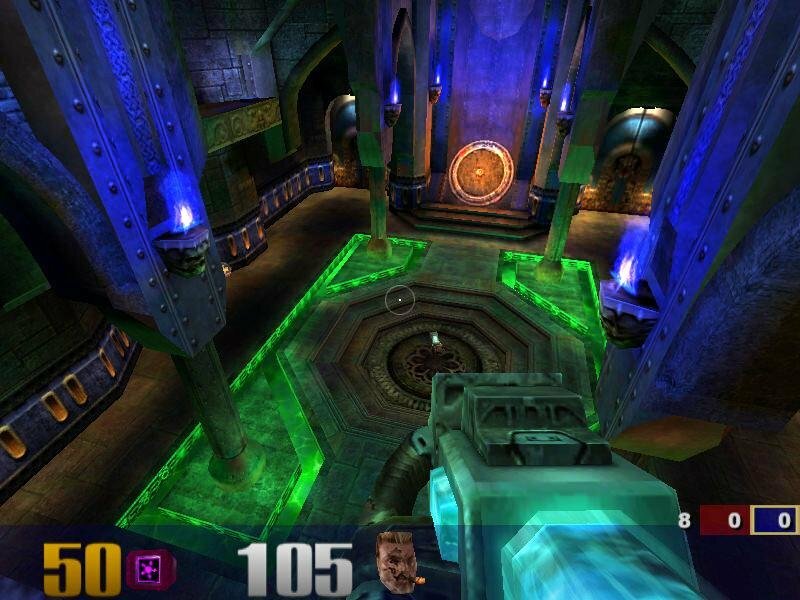 This could have been the pinnacle of the Quake series, but we was stolen the real single-player mode. Good for Multiplayer lovers, but sad for the few rest of us. 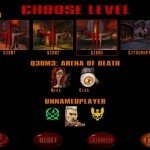 It was a problem to make a story-driven game besides the multiplayer?. 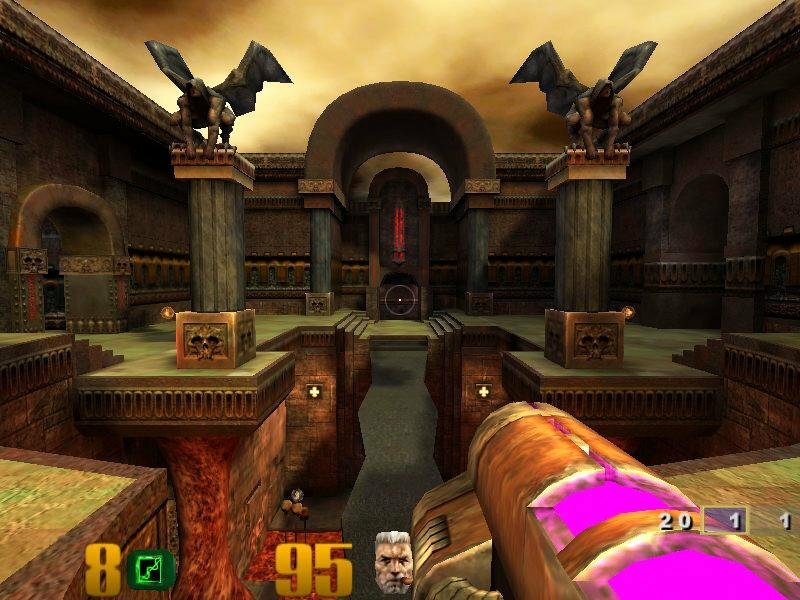 Thanks for nothing ID software. Not working on w10 home …..
trying to extract the rar file but it is asking for password ?? what is the password please. I get this asked sometimes. Not ONE game on this site will ask for a password. I can download / extract without any problems. The only reason I can guess it might ask for this is because I archived with WinRAR 3.0 or 2.9. If you have a very different version it might ask for a password. But there is NO password. Perfect for multiplayer, but bots are not realistically hard on nightmare. I used to beat almost all SP on nightmare (only last 5 levels in space beated on lower difficulty.) Well, maybe too hard bots can make you incredibly strong for multiplayer, but they are hell frustrating and annoyng. Much better to be beaten by pro player than bots. 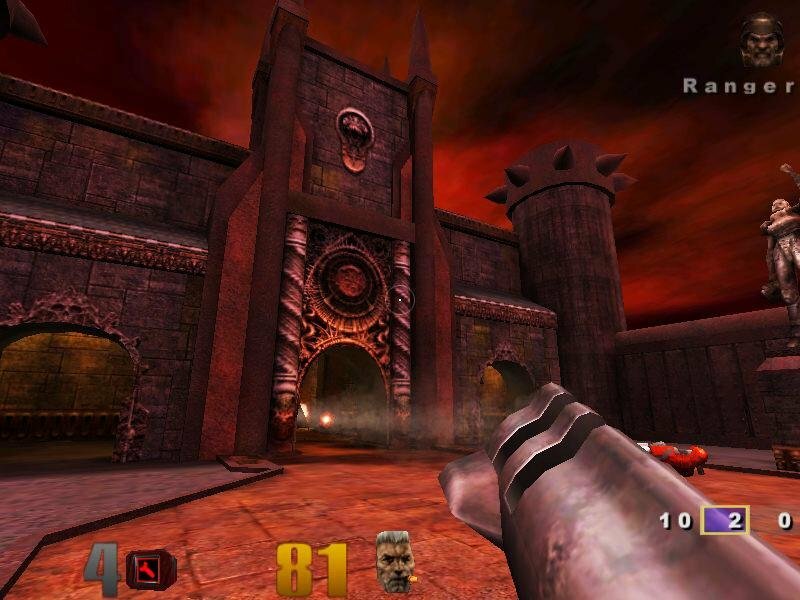 At least Return To Castle Wolfenstein gave this engine real use. 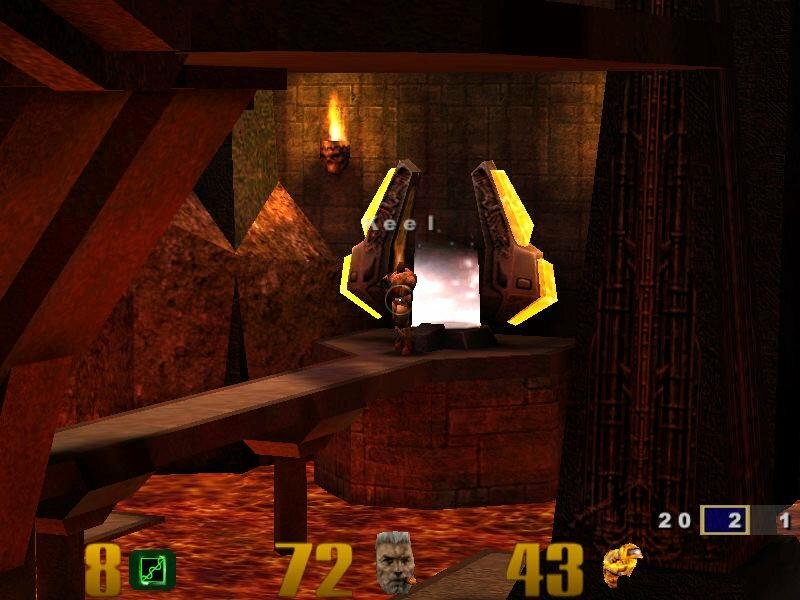 I strongly prefer the original Quake, but Quake III has its qualitites. I was also pleasently surprised that it was MP only and no unnecessary SP clinging onto it. 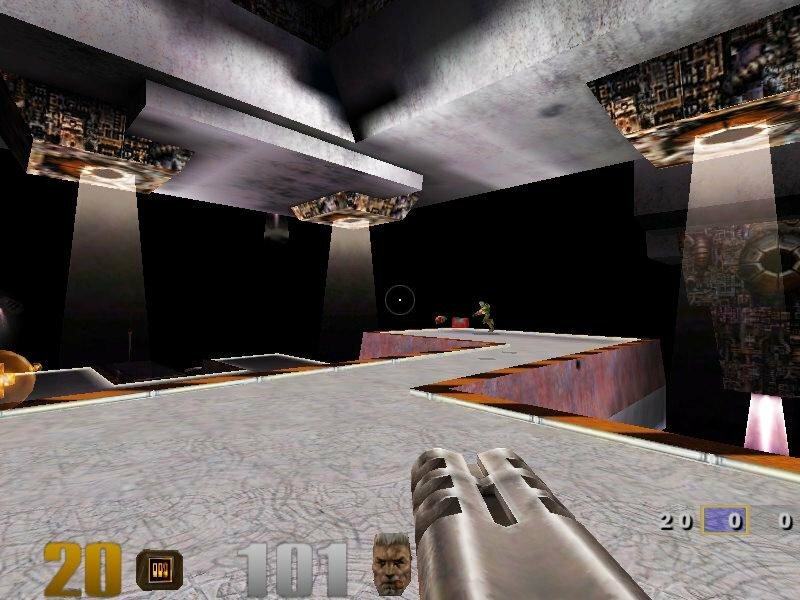 Negative for me is the intro, the very bad gibbing effects, bad rail gun effect and a somewhat “unreal-ish” art style albeit the designers at id were thankfully more crafty and talented than their competitors. The Alpha was way more “id” than the final product – still a gem and earned every bit of praise that it got.